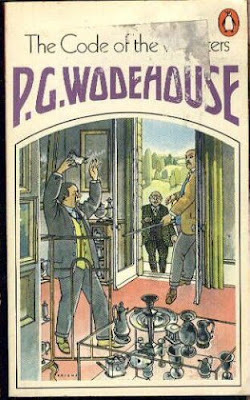 Anyway, this inevitably got me onto hunting down various Wodehouse covers. 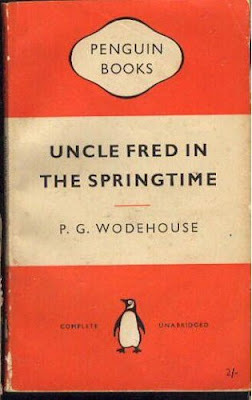 For several decades in the UK, almost every Wodehouse title has been published by Penguin, but late last year Random House took over the rights and has started pumping out the books under their Arrow imprint. In the US, Vintage and Everyman print the paperbacks and hardbacks respectively. 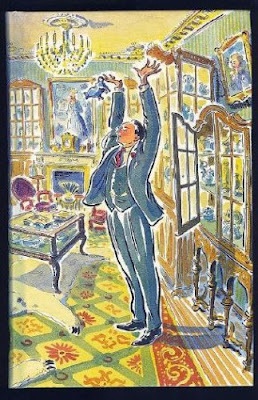 The most recent Penguin covers and the new Arrow covers are quite similar in spirit but different in execution, so I thought it would be interesting to look at them both, and compare them with other Wodehouse covers from the past. I'm only doing this for a couple of titles, as an attempt to round up all of the various covers for a writer who produced more than 90 books would kill me. 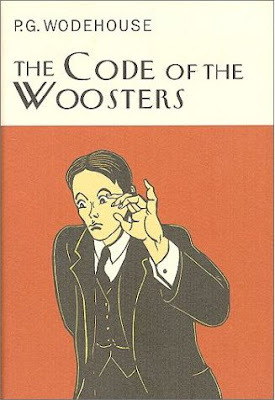 The first is Code of the Woosters, one of the classic Jeeves and Wooster books. 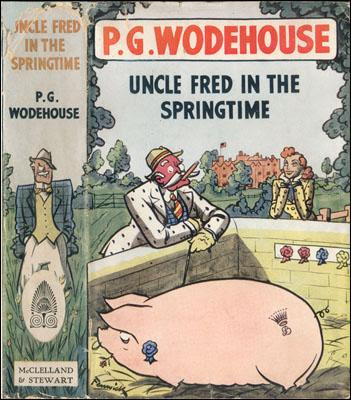 Here we have the Penguin version, with a cover illustration by the excellent David Hitch, who did all of the covers for this edition of the Wodehouse books. Then we have the Vintage US edition, with an illustration from Marc Rosenthal, illustrator, children's-book and comics artist. 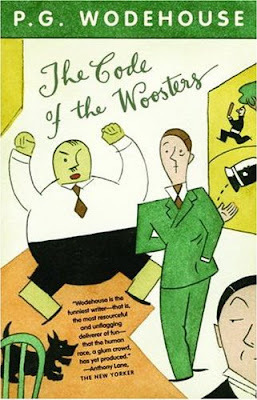 And this is the Everyman hardback, with a cover by Polish artist Andrzej Klimowski, who has similarly illustrated all the books in this edition of Wodehouse. 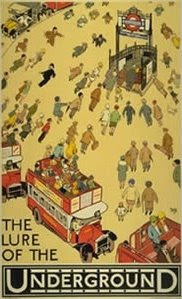 Then we have the Penguin Twentieth-Century Classic and Modern Classic editions, both using a detail from a lovely 1927 poster by Alfred Leele, 'The Lure of the Underground'. And here's the (unfortunately low-resolution) poster. 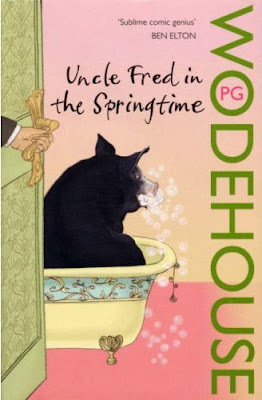 Now we'll look at a different Wodehouse--Uncle Fred in the Springtime, one of the excellent Castle Blandings books. Again, we'll kick off with the David Hitch Penguin and the unknown new Arrow editions. Here we have earlier Penguins, from 1954, 1961 and 1979 respectively (cover artists unknown for the last two). 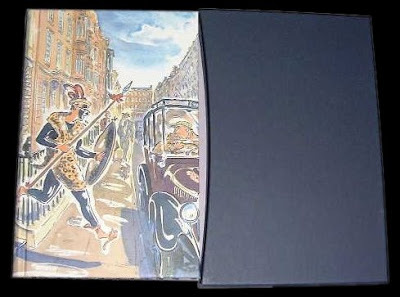 And finally a Folio Society edition from 2004, with its slipcase. 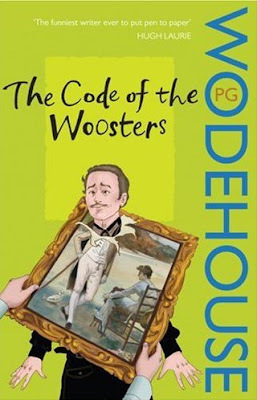 UPDATE: The deeply wise Alan Trotter points out that "the old Penguin Code of the Woosters you show was done by Ionicus, who did all the Penguin Wodehouses for years: obituaries here and here. 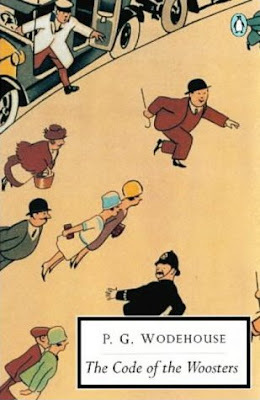 As far as I'm concerned, having grown up with his work, Ionicus is the only proper Wodehouse illustrator, though I like Klimowski too; most of the others are too cartoonish. 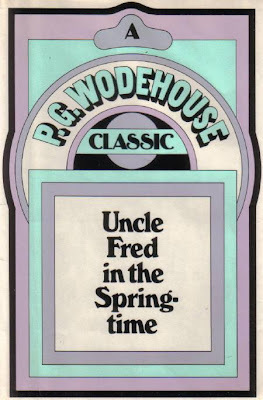 Can I warn anybody tempted by the Modern Classics cover that this edition was appallingly proofread, to the extent that a number of jokes were spoiled or lost." What an interesting comparison. 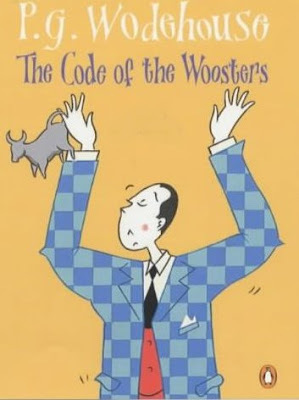 I rushed off to look at my (1960ish) copy of Code of the Woosters, and most of my Wodehouse's are missing. Maybe we've been burgled by a keen reader. Hello! GREAT blog! I recently had to order a secondhand PB copy of "Carter Beats The Devil" off (**cough**) Amazon (**cough**) because the new cover is totally bloody awful. Why do that?? Surely the old one worked fine? It's less snobbery than wanting to show the swines I don't like them messing about with a good thing... Nah, who am I kidding, it's snobbery. Tobias: someone needs to be hunted down and thrashed! Thou shalt not steal Wodehouses! Mrs Fishwife: Thanks! It's a GOOD kind of snobbery. An entirely SENSIBLE kind of snobbery. THat older cover is ace, the new one not very interesting at all. Yes, the painting on the cover of The Summer Book seems to be "adapted" from an illustration by Tove Jansson for the original dust jacket of the book. Not sure what "adapted" means, exactly, but that's what NYRB tells me. Anyhow, so beautiful! I love your blog, by the way! 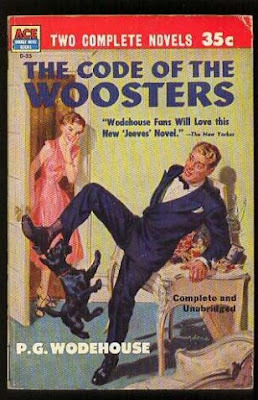 When I clicked over here I was delighted to see your rundown of all the Wodehouse covers (I've been into them lately, myself). I especially like the Penguin one based on the Lure of the Underground. Very lovely--I'll have to track one down. 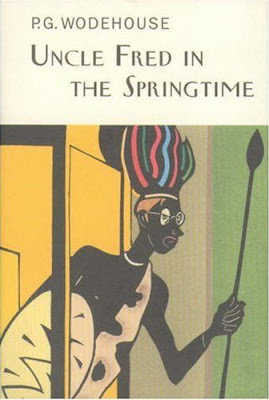 Ah, thank you for that--I've been wanting to post about that cover here, but hadn't been able to verify the picture (the copy I have of 'The Summer Book' is an old hardback with just text on the front, and the NYRB version has yet to turn up in Australia). 'The Lure of the Underground' is a great poster. I wish I could have found a better version of the whole image. It can be bought as a poster from a UK transport museum, but that's book money I'd be spending! 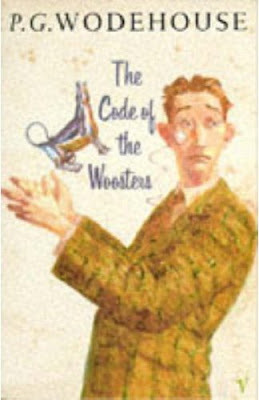 What is Franz Kafka doing on the cover of Code of the Woosters (illustration by a Polish Gentleman whose name eludes me)? I have a 1961 edition of The Ice In The Bedroom published by Simon and Schuster and I was just wondering if you by any chance new how did the cover art for it? It says the jacket design is by Paul Bacon, but it doesn't look much like any of his other artwork I've found. The cover features a great print on a yellow background of a man and woman in an elongated bold black and white style. I'd love to find out who did the drawing. Thanks for any suggestions you may have! 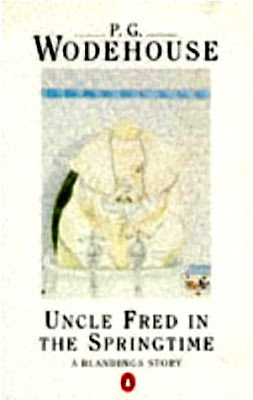 Hi, Midnightpancake: As far as I can find, it is indeed by Paul Bacon--the auction house Christie's backs this up. It's a lovely cover, and not one I'd seen before. Thanks for bringing it to my attention! 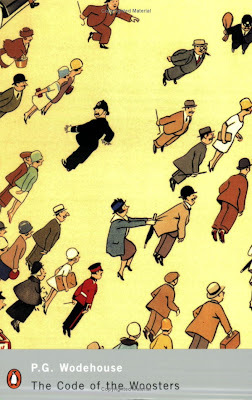 As far as I'm concerned, having grown up with his work, Ionicus is the only proper Wodehouse illustrator, though I like Klimowski too; most of the others are too cartoonish. 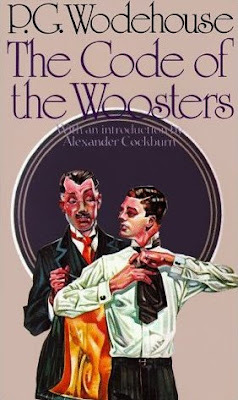 Can I warn anybody tempted by the Modern Classics cover that this edition was appallingly proofread, to the extent that a number of jokes were spoiled or lost. Ah, thank you for that information on Ionicus--I'll add it to the post. Annoyingly, the dodgy Modern Classics edition is the edition I have. 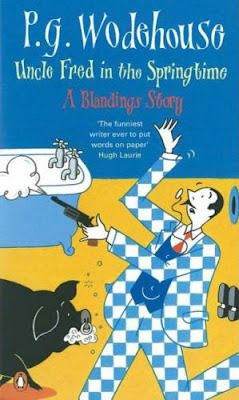 As was the case for Robert Hanks, Ionicus will always be THE Wodehouse illustrator for me. 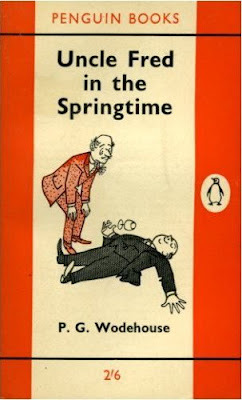 I started reading him in the 70's, and I believe I still have most of that Penguin run; they are all too decrepit to really be readable, anymore - I mostly go with the audio versions, nowadays - but I still love to take them off the shelf, occasionally, and just enjoy the covers. They are lovely: he had a knack for capturing the story in the midst of its most chaotic. The first two seem to have been published in the 1970/80s and 1980/90s respectively. 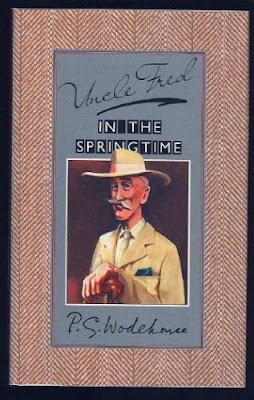 The third format is a puzzle because the illustrations are sometimes by Ionicus but are often not -as in your example for Uncle Fred in The Springtime - even when an Ionicus illustration existed. If anyone has any information on nay of this I'd be pleased to hear.